For decades Savannah, Ga.’s most popular tourist destination has dead-ended in an aging power plant. Thanks to one hotelier’s epic vision, that’s about to change. Destination 2018: San AntonioDestination 2018: Washington, D.C.
About 100 years ago, when electricity was still a fledgling technology, what would become Savannah Electric and Power decided to build a power plant on the south side of the Savannah River. The company hired a Boston-based firm named Stone & Webster, known for its management of these early utilities, to operate this one. It had a prime location: the intersection of River Street, which runs parallel to the water, and West Broad Street, which had been a hub for shipping and commerce since Savannah was founded in 1733. The plant would be a beautiful building, red brick with massive arched windows facing the river, because in those days nobody knew what a power plant was supposed to look like except that it was a symbol of local pride and progress. If it weren’t for the smokestacks, Savannah Electric’s new building could have been a Gilded Age concert hall. Up and running in early 1913, the plant would be expanded and updated several times over the next five decades as the regional demand for electricity—air conditioning and nearby military bases had a lot to do with it—grew exponentially. Two additional buildings, more utilitarian than beautiful, would be tacked on to the original. But after Savannah Electric merged with utility behemoth Southern Company in 1988, the aging plant’s usefulness began to wane. In 2005, it was taken out of service. A handful of workers remained to remove asbestos and dismantle the massive turbines. By 2010, the once proud symbol of Savannah’s embrace of electric power was abandoned. A salesman and a builder, a dreamer and a persuader, Richard Kessler is the kind of person you sometimes think could only happen in America. He was born in 1946, the son of a plumber and a homemaker, in Savannah, but the family moved to nearby Effingham County, a sparsely populated rural area that’s part of the Savannah metropolitan area. Kessler went on to earn bachelor’s and master’s degrees in industrial engineering and operations research from Georgia Tech, and at age 23 he started working with real estate developer Cecil B. Day. The two would launch the Days Inn hotel chain, the first of which was located on Tybee Island, about 18 miles east of Savannah. At 29, Kessler became the president and CEO of Days Inn. When the chain was sold in 1984, he branched out on his own, launching the Kessler Collection of hotels and partnering with Marriott as a founding member of that company’s Autograph Collection. The Kessler Collection now includes nine hotels, mostly in the Southeast, two of which—the Bohemian and the Mansion on Forsyth Park—are in Savannah. Child of a blue-collar family, Kessler is now a very wealthy man, and he has pursued interests that it’s unlikely he could have imagined as a child. He knows his wine with meticulous detail; he hunts big game in Africa; he collects art—mostly paintings—and fills the walls of his hotels with things he likes. He also collects fossils and rocks. A descendant of Lutheran immigrants, Kessler for years collected Reformation imprints and manuscripts, until he donated his collection to Emory University in the form of the Richard C. Kessler Reformation Collection. The collection contains more than 1,000 publications by Luther himself—the largest in the country, according to Emory. In the following decades, city officials worked to spruce the place up and turn it into a tourist attraction. They succeeded almost too well. Buoyed by its representation in the movie Forrest Gump and the book Midnight in the Garden of Good and Evil, fueled by a law that permits open containers of alcohol in public and with an influx of tourists lining up to get into Paula Deen’s hit restaurant the Lady and Sons, Savannah became the go-to place for drunken weekends, ghost tours, trolleys around the historic district and bachelorette parties. And River Street, with its ubiquitous bars, candy stores and tchotchke and T-shirt shops, was the rowdy, rambunctious, slightly tacky heart of it. Kessler held a meeting with local politicians, businesspeople and community leaders to ask what they would do. Later, he held a follow-up with a group of architects and planners. He credits all the participants for having good ideas—some “brilliant”—but you can’t help but get the feeling that Kessler knew exactly what he wanted to do all along. 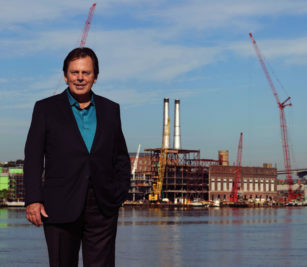 His vision was not just for a hotel, but what he calls an “entertainment district.” At 670,000 square feet, the Plant Riverside District would encompass three hotels that all operated under JW Marriott—the Three Muses, the Atlantic and of course the Power Plant—13 food and beverage operations, three rooftop bars, a performance space, 20,000 square feet of retail and a plaza for open-air concerts. Adding a quarter mile of river walk would transform the west end of River Street, long the corridor’s lackluster half. 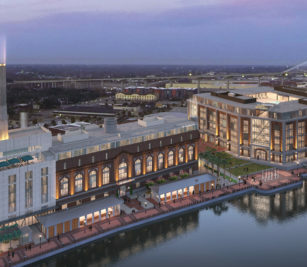 Funded largely by Wells Fargo, the budget for Plant Riverside was estimated at $270 million; if there’s been a larger construction project in Savannah, no one can think of it. Oh, and then there’s the dinosaur. When Kessler toured visitors through the power plant, they kept telling him that the place was big enough to be a museum. So, idiosyncratic as ever, he decided to turn it into one. “I thought, We can tell the story of the origin of power,” Kessler explains. “And that leads you right into the dinosaurs.” Kessler found a guy named Dave Trexler, a paleontologist who helped found the Two Medicine Dinosaur Center in Bynum, Mont., who said that he could build Kessler a dinosaur—a 137-foot-long seismosaurus that would hang over guests 10 feet in the air. “I mean, who’s thinking about a dinosaur?” Mayor DeLoach says. “Richard Kessler’s thinking about a dinosaur. But I was thinking, This is the west end of Savannah, and it’s been a dump forever. And he put $275 million into the corner of a dump, and they’re gonna put a dinosaur in there? Groundbreaking began in 2016. In mid-2017—Plant Riverside is expected to open in June 2019—I took a tour of the site with Kessler, who reeled off facts and figures as we went along. Workers had removed 1,400 tons of steel from the building and put back even more. To restore the original bricks, they had washed 650,000—yes, 650,000—by hand. Thirty feet under the waterline, they had discovered a bed of timber that dated back to the late 18th or early 19th century—the foundation for some sort of building. “Nobody could figure out how the heck they did that in those days,” Kessler says. “So we’re dragging out trees that have been buried, hard pine trees, some of these boards are at least three feet wide”—meaning that given how long they’ve been buried and how long they would take to grow to that width, these trees are probably 400 to 500 years old. To preserve and display history, all of it is going back into Plant Riverside. 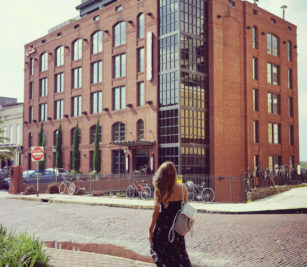 In the Savannah midsummer heat, Kessler walks me up three flights of iron stairs to the rooftop of the power plant. He’s probably made the walk dozens, if not hundreds, of times before, but he seems as excited as if it were the first, and though he’s 20 years older than his guest, I am more out of breath than he is when we reach the top. The view is astonishing. South is the city of Savannah; north is the opposite side of the river; to the west lies the Port of Savannah and to the east is the panorama of River Street.